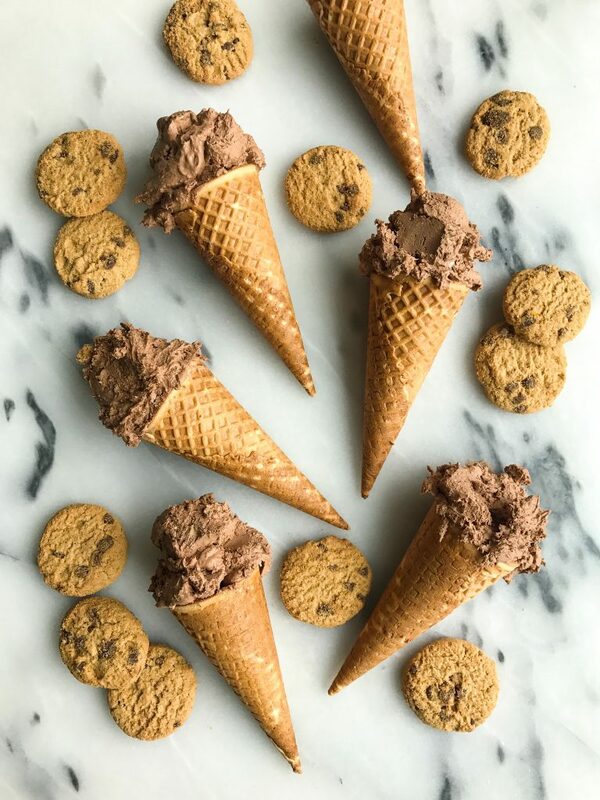 Blended Crunchy Chocolate Cookie “Freeze” Ice Cream for a plant-based cold treat! It is here friends. My homemade wanna-be Pressed Freeze recipe and I am pumped about it. It is also my 27th birthday so that’s pretty crazy. I used to countdown the days until my birthday growing up. It was pretty much a national holiday if you asked me and my family, which is comical because now I am meh about it. When I was growing up we had homemade cake, balloons and a flipping awesome birthday party each year. Cinderella did make a appearance once year too.. just sayin’. I had tea parties, ceramic making parties, Britney Spears concert (LOL), pretty much anything I wanted to do my parent’s gave me. I feel so damn grateful for that. They always and still do go above and beyond to make sure my birthday is the best day. This year my Mom and Dad are coming into the city to spend the day with me since Jord has work all day. The new tradition my Mom started last year when she came in. We are going to go out for lunch, walk around and enjoy the day. I have so much to be grateful for this year it really makes me feel so emotional. I am tearing up just thinking about it. 26 was a beyond magical year. I feel so grateful that I wake up and get to do what I love everyday. A lot has happened in the last year and a half. I was fired from my job and started my own brand. I finally started eating meat again, found a sense of peace and body love. Jord and I moved to a new neighborhood in NYC. I got to travel to California twice. I calmed the f down and learned how to relax a bit more and not stress so easily. I can’t even imagine topping 26 because it honestly was a my favorite year yet. I am still in that “newlywed” phase with J and I am surrounded by so many amazing friends and my family. What more could a girl want? Let’s talk about one of the best things I ate though in the past year. Pressed flipping Juicery FREEZE. I tried it for the first time last August when my parents and I headed out to LA. I made my Mom head right there with me from the plane and I salivated the whole way there. My first order ever was chocolate freezer, almond butter, chocolate drizzle and chocolate chips. Ya, I don’t mess around. While this homemade recipe isn’t as perfect as the real thing, it hits the spot when I make it and don’t have time to make it over there. 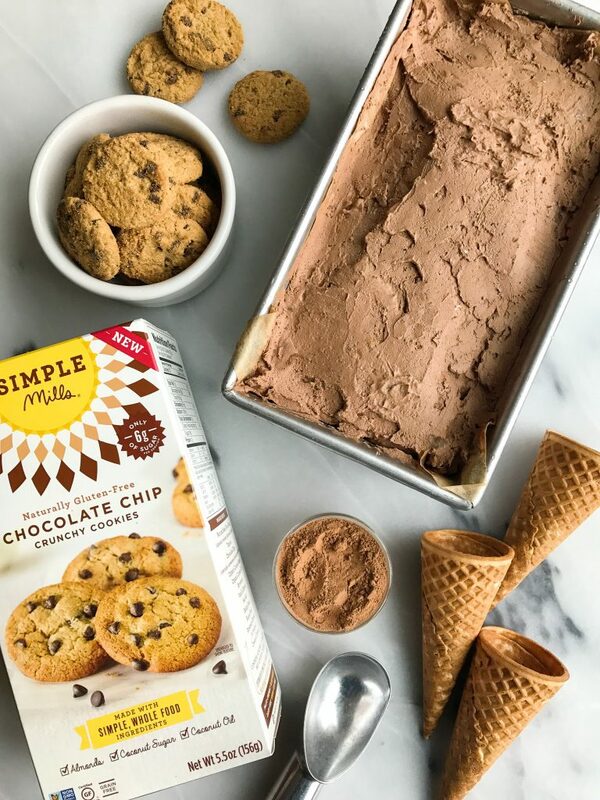 Plus it is the best way for anyone to enjoy a lighter “ice cream” option without having dairy and without using an ice cream maker. The best part of this ice cream are the blended chocolate chip cookies inside. I used Simple Mills Ready-to-Eat Chocolate Chip Crunchy Cookies. Yup, they are already made and ready to eat, no mix or baking involved. These cookies pretty much changed my life the second I bit into one. I used to be a huge Chips Ahoy gal and TBH they remind me of them. Except they are made with REAL FOOD like all of Simple Mills products. They are sweetened with coconut sugar and have a nut blend mix. 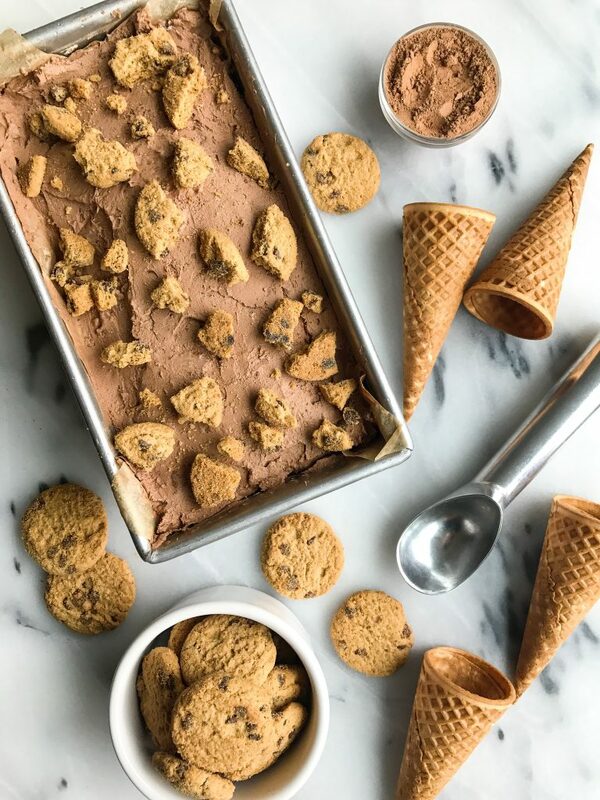 They are c-r-a-c-k and you are going to love them solo and in this Blended Crunchy Chocolate Cookie “Freeze” Ice Cream. So I Ate Meat for the First Time in 5 Years..
Appproximately how much coconut cream do you end up using do you think? Trying to figure out what the macros would be for this because it sounds bomb!! It looks so thick and creamy. I’ve heard so many good things about Pressed. It sounds delicious. Thanks for sharing! Could you use coconut cream instead of the cream from coconut milk? Is it the same thing? Thank you! So, you can put the fresh mixed ice cream into the freezer, and the consistency is like “normal” ice cream? Take it out when you want, scoop, but it back etc.? I like the beldner ice creams with fruit (with and without banana) most, because they are just really healthy, without extra sweetener or date sweetened. I’ve been seeing Pressed Freeze all over instagram lately! So sad we don’t have one in Columbus (but it’s also probably a blessing in disguise because I know I’d eat it every day hehe). Can’t wait to try this out! Looks amazing! Do you think I could use reduced fat coconut milk instead of the full?